According to historians, the cult sculpture on the territory of Belarus origins in the Paleolithic times. 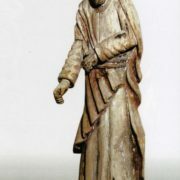 To early samples of the monumental sculpture of the ancient Slavs belonged to the figures of pagan gods, destroyed with the adoption of Christianity. Noteworthy, for Orthodox churches, volumetric plastic for many centuries remained unacceptable. 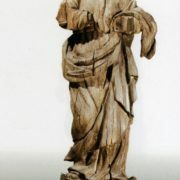 A sculpture of Christian content could appear in Belarus not earlier than the end of the 14th century. However, even in the 15-16th centuries it was still very rare. 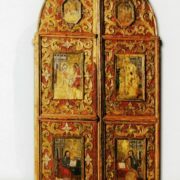 Traditionally, masters decorated churches, both Orthodox and Catholic, with painting. The earliest sculptural plot was the “Crucifixion”, usually located on the prelattic arch (girder) or at the altar of the church. Quite often under the cross with Jesus depicted the future Mother of God and the Apostle John. 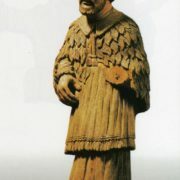 The collection of the Museum of Old Belarusian Culture includes sculptures of the 16th century. 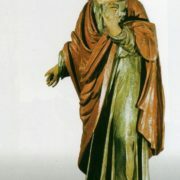 In particular, “Our Lady” and “Apostle John” from Volkovysk. The subtle features of Mary’s face resemble Renaissance images. 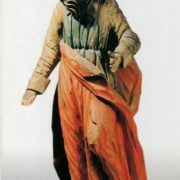 Deep large folds of clothes have a Gothic origin, and a calm straight figure and a canonical hand gesture tell us about the connection with the icon painting tradition. 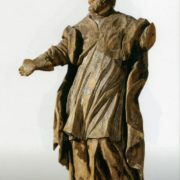 A unique example of the Renaissance sculpture are the marble figures of the subchancellor Paul Sapieha (1565-1635) and his three wives from the church in Halšany. 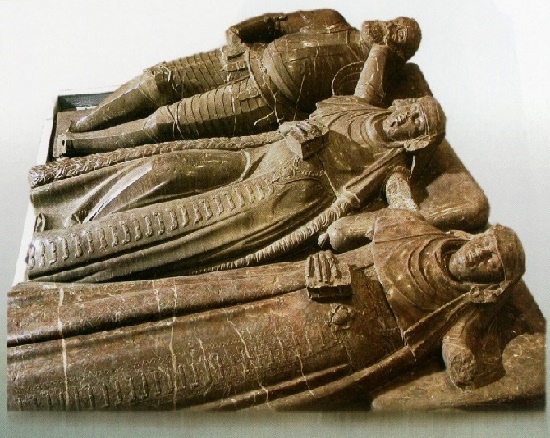 The architectural composition of the gravestone is an epitaph with a very magnificent appearance, like an altar, in which there are three women, and one – the fourth lying at the top. At the end of the 18th century, the founding chapel and tombstone were destroyed, only figures survived. Paul Sapieha – in the pose of the “fallen asleep knight”, in accordance with the Sarmatian ideology of that time. Regina Halecka and Elizabeta Vesselini – elderly women in heavy robes, with prayer books in their hands, embody the feminine ideal of a good Christian, mistress of the house. 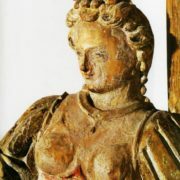 The best achievements of monumental sculpture in Belarus belong to the Baroque era. 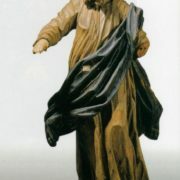 During the formation of a new style in plastic, masters often turned to Gothic patterns. 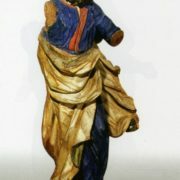 Therefore, early Baroque sculptures of saints have features of late Gothic. In particular, elongated proportions, S-like bending of the figure, increased expression, serpentine of hair curls, and sharp folds of clothes (“Gothic Baroque”). 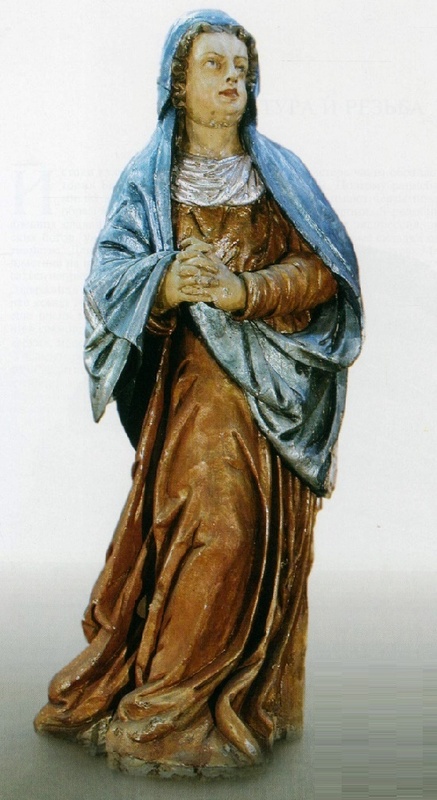 In the sculptures of Mary and the Evangelist John of Shilovich, these features are combined with Baroque. Counter-staged setting of their figures with a turn and dynamic gestures of hands, plastic draperies with rich light and shadow effects correspond to the principle of baroque aesthetics: to amaze and convince the viewer. 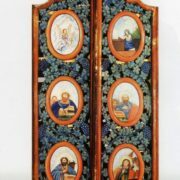 In the first half of the 17th century, a number of architectural altars were created, of which units survived – in the Volp, Nova Mysa, Kremenitsa, and Budslau. 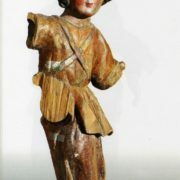 The war of 1654-1667 was the reason that during the second half of the 17th century the sculpture almost did not develop. 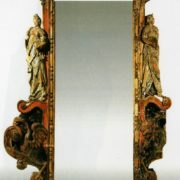 And the Baroque school of sculpture appeared in Vilna only in the 1st third of the 18th century. 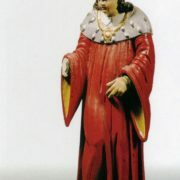 The scale of the figures was increasing, and gilding and silvering took an increasing place in polychromy. 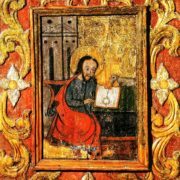 An example is the majestic “Unknown Saint Bishop” from Shereshevo of the Pruzhany district. 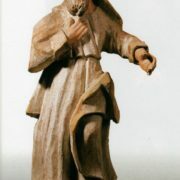 In the middle of the 18th century carvers master the dynamics of baroque: portrayed the saints in rapid motion, with determined hand gestures. Clothes acquire independent movement, stylized gowns with deep folds, as if by a gust of wind thrown aside. 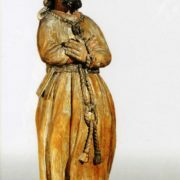 The carving of this period represented by the sculpture of the apostle Tadeusz of Trab. 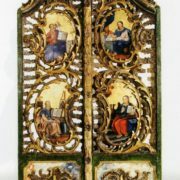 However, in the second half of the 18th century, the altar sculpture is gradually disappearing simultaneously with the Baroque style. 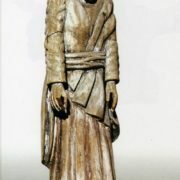 More important are single sculptures of new subjects: “Jesus before Pilate”, and folk sculpture “Jesus in Sorrow”. 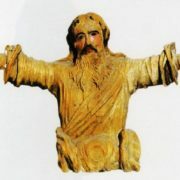 There are numerous chapels with “Crucifixion” or figures of saints. 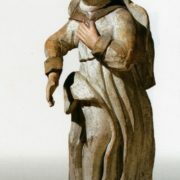 The church sculpture of non-professional masters is spreading (folk primitive). 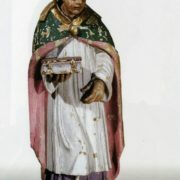 Formally simplified, plastically less perfect, it attracts by the uniqueness of the images and the unexpected iconographic features of the saints. 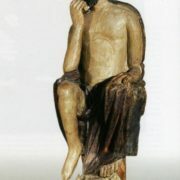 This branch of “insintitive” art represented in the museum with sculptures “Jesus in Sorrow” from Kossovo, “Apostle Peter” and “Apostle Paul” from Proshkov.